Specimen kindly loaned by Dr. Martin Luff. VC87 A very local species with most records from south and west England, west Wales and eastern Scotland (Luff, 1998), older records are more widespread; southwest England, Norfolk and Rhum. Typical habitat is lowland bogs and marshes and beside ponds without too much vegetation (Lindroth, 1974), adults occur from May to September. Although there are no records from the Herts area it seems not inconceivable that it may be found locally. 8.5-10mm. Upper surface bright metallic green, elytra predominantly darker. Head not wider than pronotum, densely and finely punctured and without or with only very indistinct longitudinal striations. Weakly sculptured, convex between eyes and strongly contracted behind eyes to curved temples. Clypeus densely punctured, labrum granulate with setae along front margin. Mandibles and palps dark metallic green. Antennae entirely black, basal half metallic green. Pronotum strongly rounded, sinuate before acute hind angles and with well developed lateral bead visible to front angle from above. Surface strongly convex and sculptured with a large puncture either side of middle and a large fovea laterally on disc, puncturation fine. Deeply and abruptly impressed inside hind angles. Elytra convex to side margin, lateral border visible from above. With four rows of large pupillate fovea, purple edged with gold and densely punctured, the two inner rows with oblong, glabrous and very shiny raised black areas, eight to each elytron in our specimen. Remainder of elytra, especially laterally, densely punctate. Prosternon glabrous or with a few long hairs. 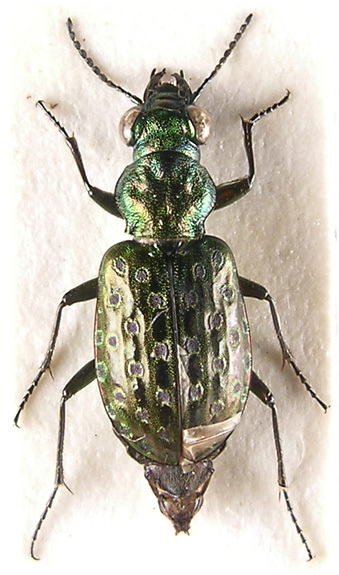 Legs entirely dark metallic; femora golden-green, tibiae and tarsi mostly black.